1. Use Profit Trigger: The app will only use the Profit Triggers if this setting is selected. To learn more about Profit Triggers click here for more info. 2. Classic View: Check this option to obtain the classic view of FBAScan’s Main Screen. 3. Calculate Profit based on FBA: The app will base your profit based on Amazon Fulfilled calculations. 4. Disable Bird View: The app will not allows you to swipe the scout screen into Bird View. 5. Use MF for no FBA in Trigger: If there is no FBA in the offer, the app will use Merchant Fulfilled in the triggers. 6. 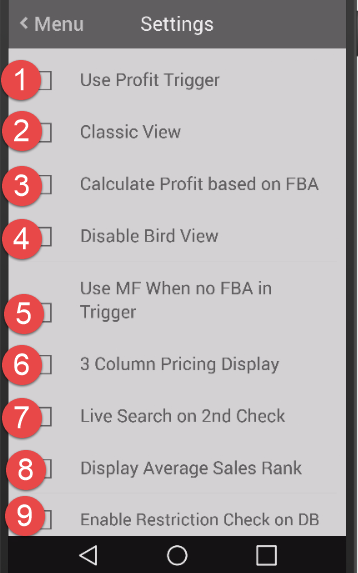 3 Column Pricing Display: If enabled, the Main Screen will display a 3 pricing column (FBA, Used, New). 7. Live Search on 2nd Check: the app will perform a live search after you scan the same barcode twice. 8. Display Average Sales Rank: Display the average sales rank over the past six months. This will give you a good indication on how quickly the item is selling. It is currently only available after a live search on Amazon US. For other countries, tap the camel icon on the bottom to navigate to CamelCamelCamel website. It will show the graph of sales rank history. 9. Enable Restriction Check on DB: The app will check to see if an item has a general restriction that applies to all sellers when using DB Mode. !Enable Restriction Check on DB is not seller specific. 10. Disable Sound: The app will not play any sound. 11. 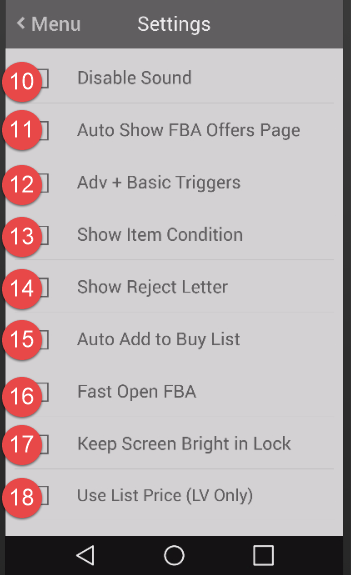 Auto Show FBA Offers Page: Automatically bring up the Amazon FBA offers page after each scan. For UPC number, the app needs to do a live search to get corresponding ASIN number before showing the FBA page. 12. Adv + Basic Triggers: The app will use advanced triggers, then basic triggers to check if an item is a buy or not. 15. Auto Add to Buy List: Items will automatically be added to the Buy Items List if it is signaled as ‘Buy’ by triggers. 17. Keep Screen Bright in Lock: Keep the screen bright when you lock the screen. 18. Use List Price (LV Only): Display the list price during live search. Please read this before you enable this option. 19. Hidden Mode: Hide the pricing information from the screen to discourage curiosity of people nearby. This setting now features password protection. !If you forget the Hidden Mode password, uninstall the app. 20. Enable Triggers: App will use either Basic + Advanced Triggers or Profit Triggers to signal if the item is worth to buy or not. 21. Display Rank Color: Change the background color based on the sales rank number. 22. Letter for Condition: Display the item’s condition in letter. 23. Use Camera: If you use Bluetooth scanner, you can disable this option, so you will not accidentally touch the camera icon to launch the camera. 24. Shake to Open Camera: Shake the phone to open the camera to capture the barcode. 25. 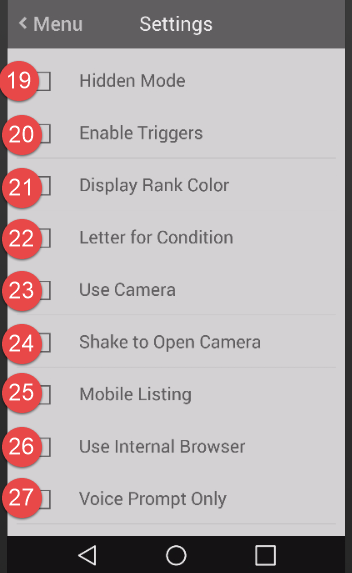 Mobile Listing: Display ‘Mobile Listing’ icon . You can tap it check if the item can be listed on Amazon or list it. 26. Use Internal Browser: Use the internal browser to open Amazon or others’ web page. If it is not working on your phone, please uncheck it and use the external browser instead. 27. Voice Prompt Only: Plays only the voice cue after scanning. 28. Voice Prompt for Title: Include the title in the voice cue. 29. Voice Prompt for Lowest of All: Include the lowest price in the voice cue. 30. 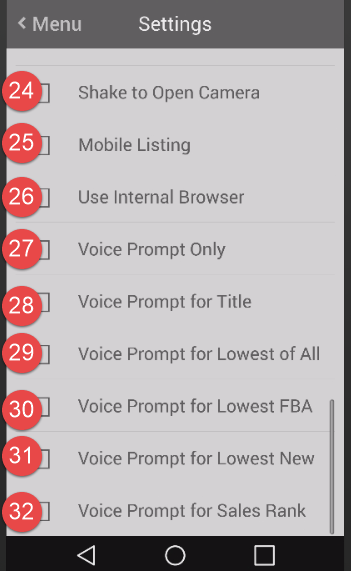 Voice Prompt for Lowest FBA: Include lowest FBA price in the voice cue. 31. Voice Prompt for Lowest New: Include the lowest new price in the voice cue. 32. Voice Prompt for Sales Rank: Include the Sales Rank in the voice cue.